This summer we completed a project for the Isle La Motte School Elementary School. 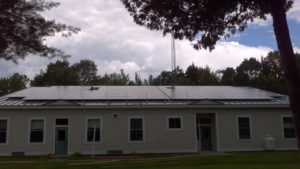 This is a 47 KW system and is estimated to offset all the electrical usage at the school. The system was designed to attach to the standing seam roof without any roof penetrations. Due to a few shading obstacles, it was designed using a relatively new optimizer system. Each solar panel has its own optimizer so that each panel can perform independently at its best. If one panel is shaded, other panels on the roof are not affected. We are very excited to help the school become closer to carbon neutral and realize long term savings for the town taxpayers!